Spring and summer are the seasons that beckon everyone to spend quality time outdoors. Making the most of the weather often comes with hosting patio parties, picnics and outside get-togethers. When its time to create the ideal centerpiece, consider transforming a standard cake stand into a lovely terrarium. This DIY doesn’t take long and can be a fun project to do with kids as well. Adding some crochet lace to the rim of a cake stand gives the final product an elegant touch. The glass cake cover will work perfectly as a terrarium cover for the succulent plants within. Complete the summer look of a cake stand terrarium by covering the cake plate and foam block that holds the plants with craft pebbles. While these can easily be purchased from a craft store, it would be just as simple to select some from outdoors, making this project an even more authentic outdoor accent piece. 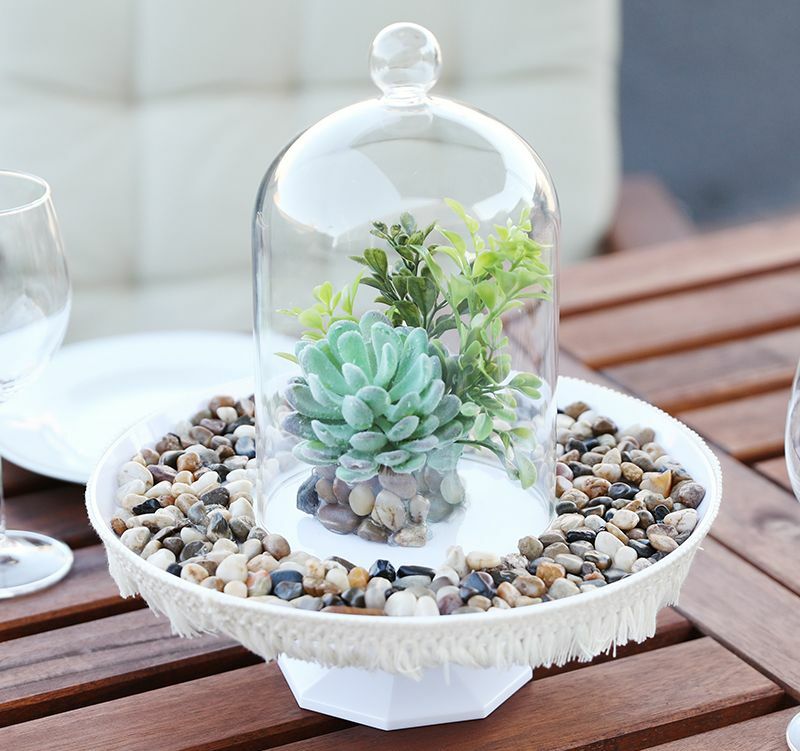 When finished, a cake stand terrarium makes a great centerpiece for a picnic table or near patio furniture. While it’s summer essence is hard to miss, consider bringing this project indoors during the winter months to keep the greenery in style year-round. 1. Place a cake stand on a flat surface. 2. 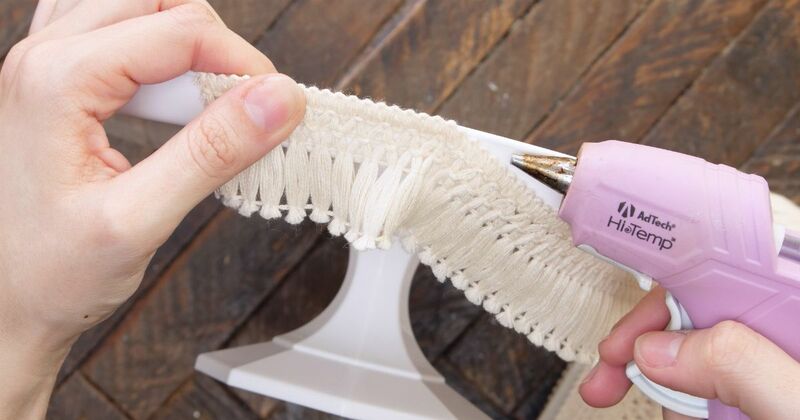 Pull 2 inches of white, crochet lace ribbon from a spool and hot glue the edge to the rim of the cake stand. 3. Continue gluing the ribbon around the entire circumference of the cake stand until the edges meet. 4. Cut the ribbon from the spool. 5. Cut the bottom edge of the ribbon away so the tassels remain hanging down from the cake stand. 6. Place the glass cake cover in the center of the cake stand, and trace the bottom using a green pencil. Remove the glass cake cover when finished. 7. Apply a spot of hot glue anywhere on the green circle, and press a craft pebble to the glue to attach it. 8. Continue gluing and attaching individual pebbles side by side until the green circle is covered. 9. Cover the remaining surface of the cake plate between the pebble circle and outer rim with hot glue, and fill it entirely with craft pebbles. 10. Place a green foam block in the center of the cake stand. 11. Press a large, plastic succulent plant into the foam followed by four decorative greenery stems. 12. Hot glue pebbles onto all four sides of the block once the plants are in place covering the foam entirely. 13. Place the glass cake cover over the plants, and display the cake stand terrarium on an outdoor table as a centerpiece.